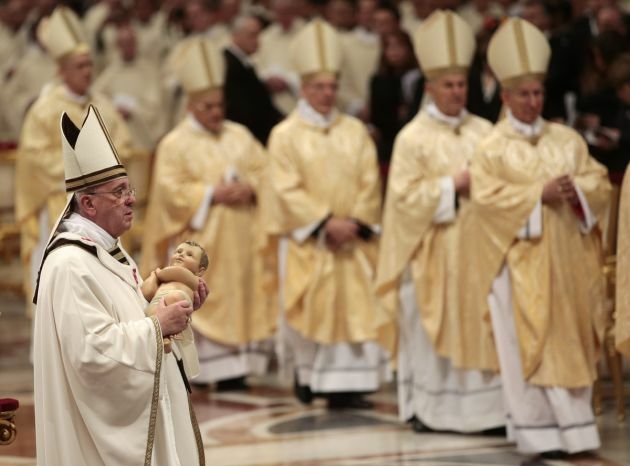 (Photo: REUTERS / Tony Gentile)Pope Francis holds the baby Jesus statue at the end of the Christmas night mass in the Saint Peter's Basilica at the Vatican December 24, 2013. In his first Christmas as pontiff, Pope Francis has called for prayers for peace in major conflict areas of the world, also urging non-believers to unite with the faithful in that quest. Speaking before tens of thousands of people in his annual Christmas "Urbi et Orbi" (to the city and world) message, Francis cited Syria and the "often forgotten" Central Africa Republic as well as South Sudan, Nigeria and Israel and Palestine. He also mentioned Decmocratic Republic of Congo. "So many lives have been shattered in recent times by the conflict in Syria, fueling hatred and vengeance," Francis told a big crowd at St. Peter's Square. "Let us continue to ask the Lord to spare the beloved Syrian people further suffering, and to enable the parties in conflict to put an end to all violence and guarantee access to humanitarian aid. (Photo: . 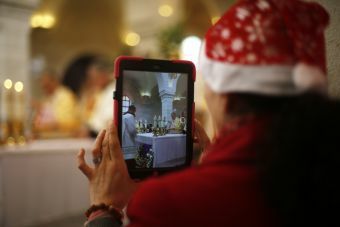 REUTERS / Mohamad Torokman)A visitor takes a video as the Latin Patriarch of Jerusalem Fouad Twal leads a Catholic mass at the Church of St. Catherine, which is connected to the Church of Nativity, in the West Bank town of Bethlehem on Christmas day December 25, 2013. "We have seen how powerful prayer is," said the pontiff in the address which is closely watched by more than 1.2 billion Roman Catholic faithful and is broadcast globally. The Pope said he was happy that followers of different religious confessions are joining prayers for peace in Syria. He praised the "courage of prayer! The courage to say: Lord, grant your peace to Syria and to the whole world." At the same time Pope Francis was strongly applauded by the crowd when he called on atheists to join the quest for peace. "I invite even non-believers to desire peace," said Francis. "Let us all unite, either with prayer or with desire, but everyone, for peace," he said, drawing sustained applause from the crowd." Francis all asked God to grant peace to the Central African Republic, "often forgotten and overlooked." The pontiff also asked God to "foster social harmony in South Sudan, where current tensions have already caused numerous victims and are threatening peaceful coexistence in that young State." In Bethlehem the Latin Patriarch of Jerusalem, Fouad Twal, the top Roman Catholic cleric in the Holy Land celebrated Christmas midnight mass at the Basilica of the Nativity. In his homily, Patriarch Twal recalled the many crises and conflicts around the world. "But we must never give in to despair," he said "because Jesus, our Saviour has told us that peace is possible, that the flame of hope remains alive, that justice and reconciliation will come." Such a painful reality raised several questions about the future of people living in the Holy land causing much concern. "We need the answer of faith. The answer lies neither in emigration nor in closing in on ourselves. It consists in staying here and in living and dying here. "Our Land is holy and deserves our attachment to it, for our presence in this land is a divine vocation, a blessing and a privilege. The flame of faith burns strongly here, like the star of the Magi, to guide us. We need the comfort that comes from our absolute faith in the Providence of God."